I am highly suspicious of all works by authors described as “the next best thing to reading Jane Austen” (unless that author is Barbara Pym), so I was a reluctant latecomer to the novels of Georgette Heyer. A few years after that first attempt, in a readers’ advisory class in library school, one of my classmates recommended The Grand Sophy to me. I pooh-poohed. I thought I knew better. But another classmate urged me very articulately to reconsider, saying that she didn’t know who was responsible for choosing the order or frequency with which Heyer novels are republished, but someone should really take that person in hand. That following summer, when the stress of my sister getting married and moving halfway across the country was rising, I gave The Grand Sophy a try. If ever there was a time for escapist Regency fiction, it was the summer of 2010. I’ve written elsewhere about The Grand Sophy, Frederica, and Arabella. What I didn’t say there, though, was that I read The Grand Sophy in less than a week while on my sister’s bachelorette trip in San Francisco; I finished it on the flight home, and immediately upon finishing it, still on the plane, downloaded Frederica to my kindle. Since reading those three, I’ve gone on to read many more, including: The Nonesuch, Lady of Quality, The Reluctant Widow, Talisman Ring, and, best of all, Venetia. Venetia is far and away my favorite Georgette Heyer novel. Featuring the two most well-read and well-spoken of Heyer’s characters, it’s the sparkliest of the sparkly banter – and happily, unlike some of Heyer’s novels, our hero and heroine get to spend a lot of time together. I like all of Heyer’s older, “on the shelf” heroines, but Venetia is my favorite probably because I identify the most with her character. She’s a prettier, much more fun and witty version of myself, like how I imagine myself to be on my best days, if all my lines were previously scripted and I had met a worthy opponent. And speaking of worthy opponents: Lord Damerel is a shining example of that ever-so-attractive archetype, the rake seeking redemption (even if he isn’t quite aware of it yet). But this post isn’t just about Venetia as a novel and how I reread my favorite parts at regular, probably embarrassingly frequent, intervals; it’s also about Venetia, the audiobook, read by Richard Armitage. It’s simply excellent, and worth checking out whether or not you’ve read the novel. If ever they make a movie version of Venetia, which is a marvelously good idea, they really need to have Richard Armitage play Lord Damerel. I consider Mr. Armitage to be the nonpareil portrayer of conflicted emotions, smoldering glances, and eyes that are “smiling yet fierce” (see North and South); he really is the only choice. And obviously, I would play Venetia. I have no acting training, but I believe, in this case alone, the sheer force of my enthusiasm and familiarity with the story would carry the day. This entry was posted in Books, Reviews, and Reading and tagged books, Georgette Heyer, Jane Austen, library school, reading, Venetia on May 1, 2012 by ms.grammarian. 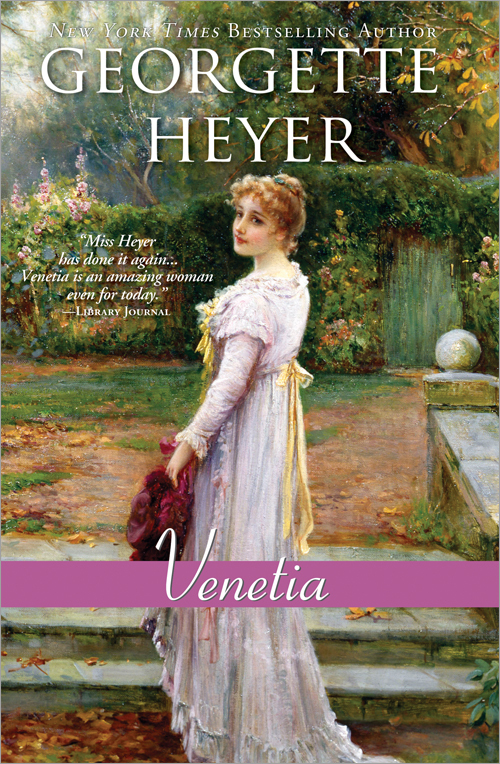 Venetia is my favorite Heyer as well, followed by Sylvester. Sylvester — another great one! Her books are so much fun! I love Venetia as well and wholeheartedly concur that Armitage would make the best Dameral. If you haven’t read Cotillion yet, you should give it a try soon. I also usually prefer the older heroines, like Annis Wychwood and Hester Theale, but Cotillion, even though it has a young hero and heroine makes up for it by having Freddie Standon! (and his father, Lord Legerwood!!) Would love to know what you think of it if you do read it. I will definitely give it a try! It’s always nice to get Heyer recommendations!